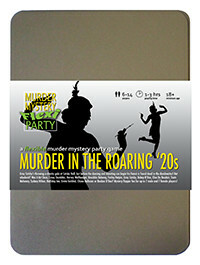 You've been invited to play the role of FARLEY HATPIN in Murder in the Roaring '20s. Gray Catsby has invited his most talented and wealthy friends to a charity gala event at his countryside residence, Catsby Hall. But before any dancing and donations begin, Catsby’s fiancée, Ginger Whiskers, is found dead in the dumbwaiter! Join the flappers and dappers to find out who finished her off! You’re dressed in a three-piece suit with bowler hat and cane like you’ve just walked off a film set. The top is tight and untucked, the trousers baggy, the shoes too big - but the moustache is just right! You started out performing Shakespeare behind a shop window but later realised nobody could hear you, so began to exaggerate your gestures for applause. This drew even bigger crowds and so you began your career as a silent film auteur. You met Catsby when he financed one of your films and have remained friends ever since. He can’t stand your silent phone calls though. I’m Farley Hatpin - actor, director and yes, this is what my voice sounds like. It’s a crying shame what’s happened to Ginger, such a lovely girl. I still remember the party where I first saw her. Such talent. Anyhow, the show must go on, as they say in the theatre, and I’m starving - so can we hurry up and find the murderer so we can eat?